This Demo 2018 Crazyfly Tango 12m is in great shape, practically brand new and only flown a couple times with no damage or repairs. Kite complete comes with kite, bag, bar, and lines; no leash or pump. The 2018 Crazyfly Tango is a high performance freeride and wave kite for advanced to expert riders. The Tango is a modern open C-shape kite with lots of pull, power and pop. The Tango loves boosting and floaty jumps with amazing hang time. It turns quickly with predictable power and moves exactly where the rider wants it to go. Powered kite loops come with ease, plus the Tango provides amazing upwind abilities. The 2018 Tango ? anything you want. Swept Leading Edge Seam - By challenging the traditional kite construction for improvements, we came up with the swept leading edge seam. The leading edge seam on the wingtips of the kite is swept higher towards the canopy where it has less influence on airflow. This allows for higher aerodynamic efficiency and more precisely controlled kite. United Dacron Panel - This revolutionary feature increases the kite?s rigidity and reactivity allowing for better flight experience. Every seam on the kite gets stretched over time, especially in the stressed area pulled by the backlines. So, instead of using multiple Dacron panels, we used a single United Dacron Panel. The reactions of the kite are noticeably quicker and they do not fade over time. Synergy Strut Bond - Another upgrade this year is the Synergy Strut Bond, in other words, how the struts connects to the canopy of the kite. 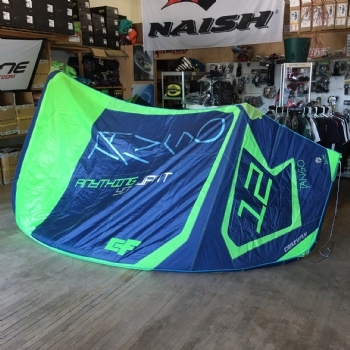 Instead of a single attachment seam, we connected the strut to the canopy with two parallel seams, creating the ultimate synergy between the strut and the kite. This synergy noticeably improved how the kite generates power during turns and kiteloops and how it holds its shape during flight. Linked Bridle - Brand new for 2017 kites, the Linked Bridle does not have any pulleys nor sliders. It creates a direct link between the rider and the kite, resulting in faster kite reactions and more controlled handling. The Linked Bridle is also much more durable than conventional bridles, as it reduces bridle line movement and abrasion to minimum. Two in One Leading Edge - We narrowed down the number of panels by nearly 50% on all our kites. Because the material itself is always stronger than a seam, having less panels and less seams results in a much stronger leading edge. Less seams also increase precision of the leading edge shape, as seams can cause a small misalignment. The two in one leading edge is the most precise and the strongest leading edge till date. Strut Junction - We have completely changed how the strut is connected to the leading edge. The connection is now stronger, cleaner and straighter without unwanted material folds, which cause quicker wear. The whole junction is reinforced with Arptex material for ultimate strength and durability. Soft Leading Edge End - Towards the end, the leading edge diameter has been optimized and decreases to prevent the bladder slipping out of the kite under pressure. The inside of the leading edge end is lined with a softer version of Arptex to create a cushion for the bladder and prevent any damage to the bladder during a kite crash. On the outside the Leading Edge Ends are protected with Arptex, the latest abrasion resistant polyamide textile from Italy. Wingtip Elbow - The Wingtip Elbow construction is stronger than ever with brand new Dacron reinforcements on the inside and Marcloth lining on the outside. Plus, the Swept Leading Edge Seam is placed in the direction in which the elbow was bending the most. These factors minimize the elbow movement, so the kite is more compact, has higher aerodynamic efficiency and better handling. Built-in Pump Leash - The Pump Leash is one piece with the central strut reinforcement. Instead of sewing the pump leash on the kite separately, which creates a point of weakness on the leading edge, we opted for creating the pump leash from the central strut reinforcement. Triplex - Brand new and exclusive to CrazyFly, we introduced Triplex, the most advanced ripstop material on the market. Triplex has by far the best strength to weight ratio and with triple coating its durability is unmatched. The coating protects the fabric from UV rays, salt and abrasive objects, such as sand. Triple coating and three ripstop yarns ensure the lowest possible elongation and deterioration of the material till date. Tailored Canopy - Smart, fitted and well cut. Without any compromise to the kite?s shape, we have created a Tailored Canopy, where we have been able to unite multiple panels into one. As a result, the canopy has less panels, which saves weight and at the same time creates a more unified and stronger skin of the kite. Dacron Canopy Covered Struts - To increase the rigidity, durability and performance of the kites, all struts are now covered and connected to a Dacron panel on the canopy which runs on the full length of the strut. This results in a more sturdy construction, more stable, and more reactive kite. Pentagon Trailing Edge - While using much more Dacron on the kite, we needed more support on the Trailing Edge. The Pentagon Trailing Edge proved to be the best solution for the current kite construction. It offers the best support and minimized flutter for optimal flight properties and long lasting durability. ArpTex Shields - Arptex sits at the top of abrasion resistant polyamide textiles. This high tech fabric made in Italy can handle plenty of abuse without getting damaged. The official number is 100 000 contacts with abrasive surface before the material starts deteriorating. This is why we selected Arptex as the most suitable material to protect CrazyFly kites in the most abused areas and increase the size of the Arptex Shields. Computed Laser Cutting - In order to achieve the highest precision and the best possible in flight symmetry of the kite, we use state of the art computed laser cutter for all fabric panels on the kites. By cutting with a laser, all kite panels have heat sealed edges at the same time. Uni Seam - Exclusive to CrazyFly, all seams on the kite run the full length of their designated space, without any re-connection. None of our stitching is ever undone and sewn again. All the seams are done in one go from their start to designated finish. 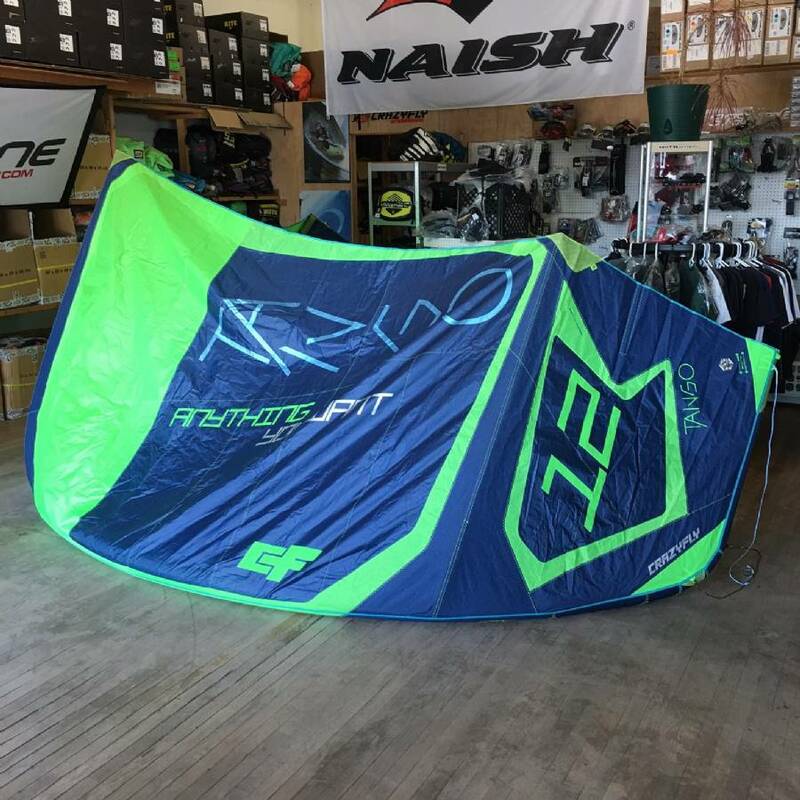 Every needle hole in the kite canopy weakens the material, so re-connecting, or repeating seams is an absolute no go for CrazyFly. German Polyester Thread - All threads used on CrazyFly kites are high end UV protected and water resistant threads made in Germany. 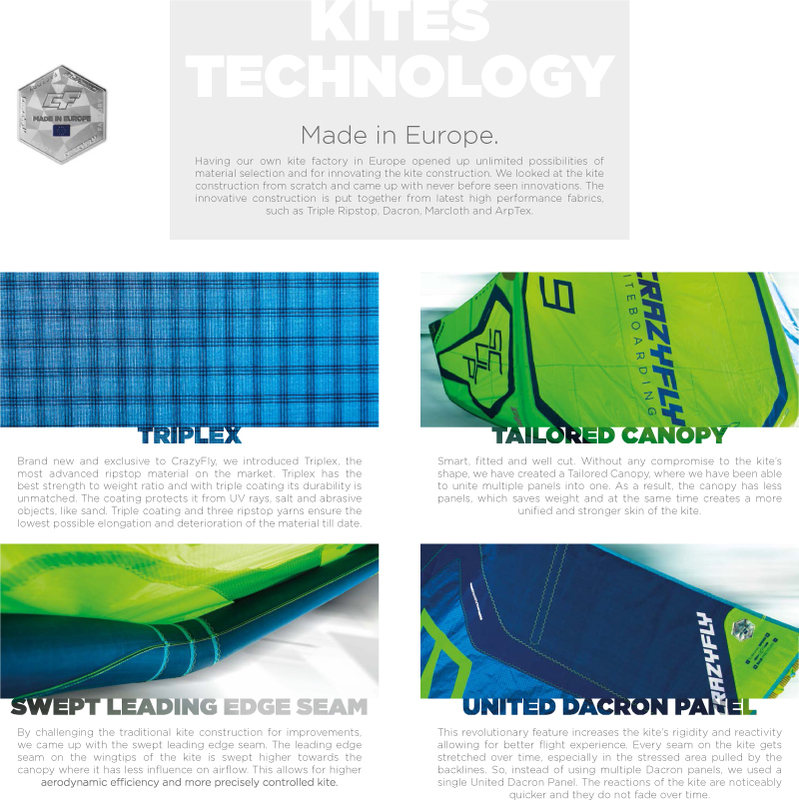 They have all properties required for the perfect kite thread: amazing strength, light weight, minimal water absorption, UV protection and high abrasion resistance. Ellipse Segmented Strut - For 2018 we implemented a brand new Ellipse Segmented Strut construction and connection to the canopy of the kite. The strut is split into three segments with an ellipse like cut. Only the segment connected to the Leading Edge has the center seam on the outer side. The top two thirds are vertically. We used the seam connecting the struts to the canopy to close the struts at the same time. These result in better profile of the strut and much more strength in the struts. Light Weight Zipper - Unlike on other kites, we selected a slimmer Lightweight Zipper covered with webbing to prevent sand from getting stuck into the zipper. 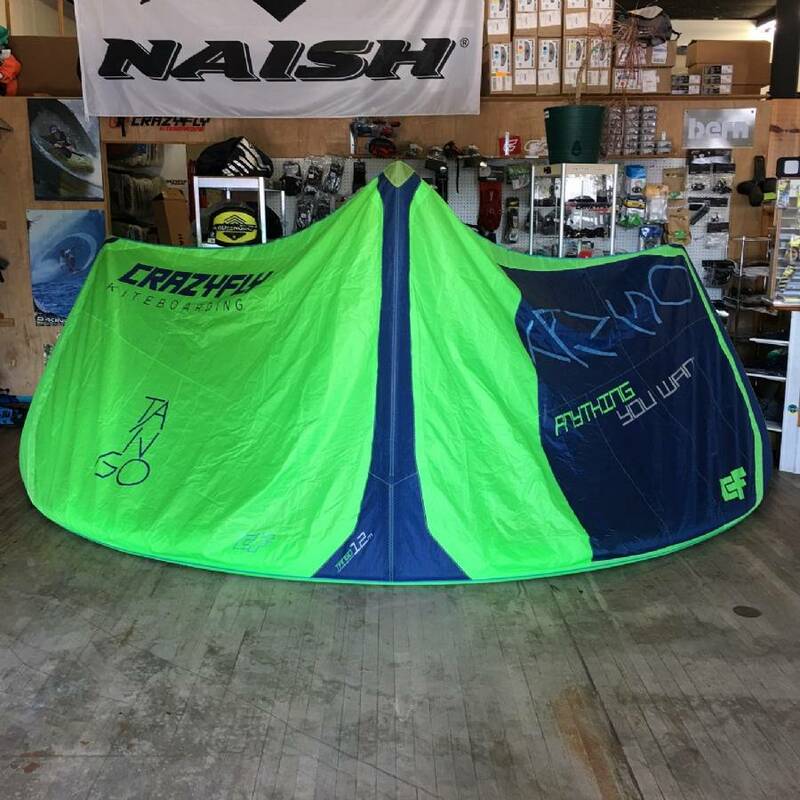 This results in flawless function of the zipper, saves weight on the kite and overall looks much cleaner than a big heavy uncovered plastic zipper. Turbo Inflate Deflate - All CrazyFly kites are equipped with Turbo inflate/deflate valve. Inflation and deflation of the kite are made through the same valve. The kite is fully inflated and deflated in seconds. This year, the Turbo valve has a new cover made from Arptex, which does not intake water and does not add weight to the kite. One Pump System - The One Pump System allow for quicker and easier inflation and deflation of the kite and ensure even pressure distribution throughout the kite. The valves are made from the highest quality material available and are manufactured in Europe. Brand new this year, the one pump hose clips are covered with Arptex, which unlike Neoprene does not intake water which reduces weight. 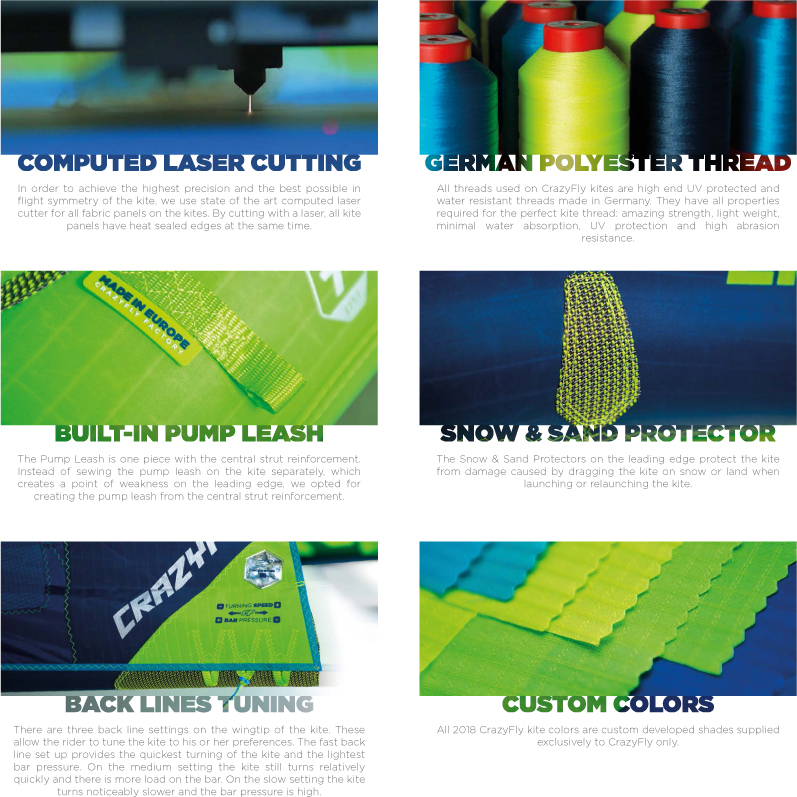 Custom Colors - All 2018 CrazyFly kite colors are custom developed shades supplied exclusively to CrazyFly only. 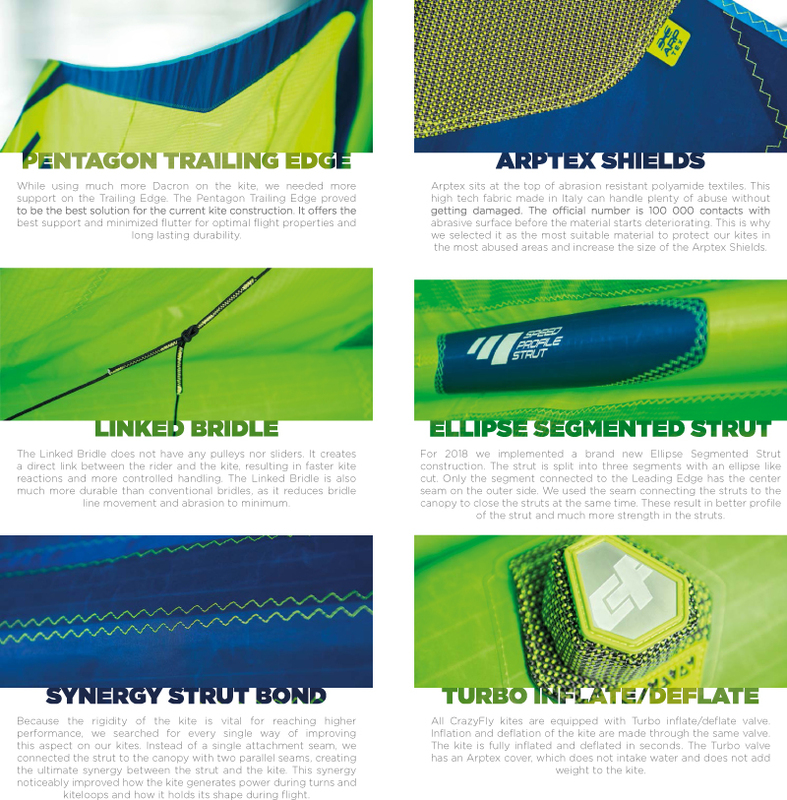 Marcloth Fusion Lining - Our engineers use Marcloth to strengthen all areas where the heavy duty kite frame materials meet the lightweight canopy. Marcloth is a mid-weight high strength fabric, ideal to create the ultimate fusion between the higher weight and lighter weight fabrics. All transitions between the frame and canopy are in round shapes, rather than sharp angles and straight lines, as the round shapes spread tension more evenly. Of course, this increases the durability of the kite. Snow & Sand Protectors - The Snow & Sand Protectors on the leading edge protect the kite from damage caused by dragging the kite on snow or land when launching or relaunching the kite. CNC Sewing - CNC controlled laser cutting ensures maximum precision of all kite panels and results in accurate kite shapes. CNC controlled laser cutting also reduces waste of offcut material. CNC sewing is used for critical and difficult seams on all CrazyFly kites. 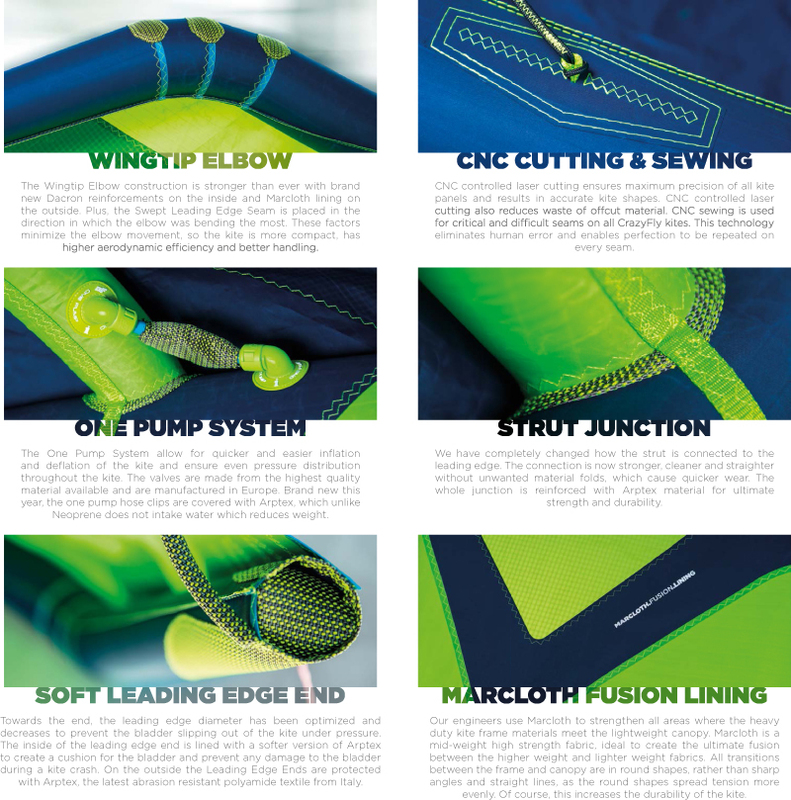 This technology eliminates human error and enables perfection to be repeated on every seam. Back Lines Tuning - There are three back line settings on the wingtip of the kite. 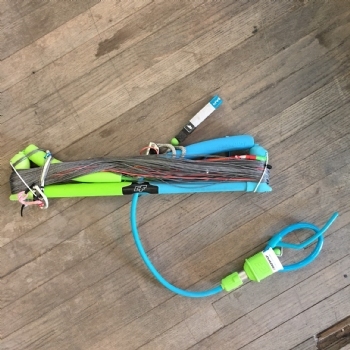 These allow the rider to tune the kite to his or her preferences. The fast back line set up provides the quickest turning of the kite and the lightest bar pressure. On the medium setting the kite still turns relatively quickly and there is more load on the bar. On the slow setting the kite turns noticeably slower and the bar pressure is high.